It has long been recognised that the hunting of pink-footed geese, as well as other huntable migratory waterbirds, impacts these populations in many ways. Management efforts have traditional focused on the influence of harvesting on population sizes, as well as the effects of disturbance on distributions and foraging efficiencies of staging and wintering individuals. The risk of wounding and crippling of birds associated with shotgun hunting was also recognised. The detrimental impacts of crippling and ways to avoid it amongst geese started to be acknowledged as requiring management attention in the 1990’s. Shooting geese by shotgun inevitably leads to wounding of some individuals. A proportion of these geese may not be retrieved and die, whilst some live and survive with a degree of crippling. Those that survive can have embedded pellets within them. 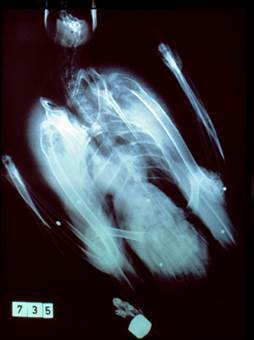 To evaluate levels of crippling samples of captured pink-footed geese have been x-rayed to determine the number of birds with embedded pellets. This data has then used access the proportion of pink-footed geese with embedded pellets and provide an estimate of a ‘crippling rate’. Pink-footed geese have been caught using cannon nets as part of an on-going population research and monitoring programme. Goose catches have traditionally taken place annually in spring in western Jutland, Denmark. Pink-footed geese, as well some barnacle geese have been x-rayed as part of this programme on and off since the 1990’s. In the spring of 2015, for the first time, the goose catch took place in Nord-Trøndlag, Norway, where an x-ray machine was again employed. Back in 1997, an action plan to reduce the degree of wounding caused by shotgun hunting was proposed by the Danish Council for Wildlife Management (a board composed of both hunting and non-hunting organizations, charged with giving recommendations to the Minister of the environment). This plan was endorsed officially before the start of the 1997/98 hunting season and was the first attempt ever made to reduce wounding on a comprehensive scale. Although not specifically targeted at pink-footed geese this initiative was credited with at least a 50% reduction in the number of individual pink-footed geese found imbedded with pellets between 1998 and 2005. For further details please see the comprehensive report “Reducing wounding of game by shotgun hunting: effects of a Danish action plan on pink-footed geese” by Noer, H., Madsen, J. & Hartmann, 2007. Building on this work the ISMP continues to focus attention on the wounding of geese, particularly pink-footed geese, both on ecological and ethical grounds. Between 2013 & 2015 the Danish Nature Agency initiated a 2nd education and awareness campaign amongst Danish goose hunters. There was concern that the crippling rate, after a period of decline, had started to increase again. Initially crippling was seen as an issue for the hunting community within Denmark but as the number of pink-footed geese shot in Norway as steadily increased it was accepted as a joint concern. At the 2nd meeting of International Working Group in October 2014, it was agreed that all relevant national nature agencies and hunting organizations would commit to sustaining a “continued decline in the monitored crippling rate”. The full meeting report can be found here. This further strengthened the initial commitment set out in the ISMP to keep crippling rates at a minimum level. In order to evaluate actions to reduce crippling the research and monitoring program, which started in the 1990’s, has continued to be run in collaboration between Aarhus University, Aarhus University¸ the Danish Nature Agency and Norway's Environment Directorate. This research is now part of the monitoring actions of the ISMP. 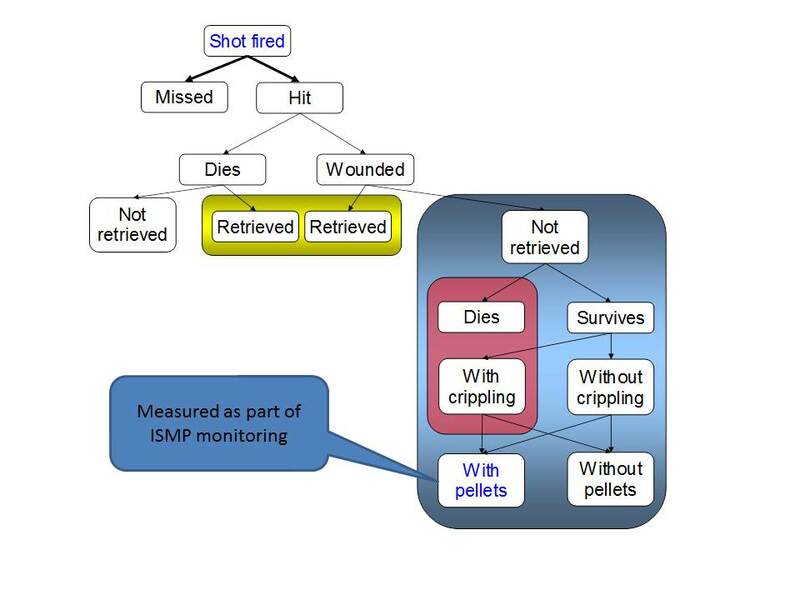 Outcomes of current initiatives to minimize and reduce the rate of crippling are evaluated as part of ISMP monitoring actions. The results of any assessments will be published and made available on this website. 2013-15 research and results concerning wounding can be found in the Technical Report no. 70 from DCE / Aarhus University (in Danish only). The 2016 wounding monitoring results can be found in a technical note published by the Danish Centre for Environment and Energy (in Danish only). An English summary is available here. Madsen, J. & Noer, H. 1996: Decreased survival of pink-footed geese Anser brachyrhynchus carrying shotgun pellets. - Wildlife Biology 2: 75-82. Noer, H. & Madsen, J. 1996: Shotgun pellet loads and infliction rates in pink-footed geese Anser brachyrhynchus. - Wildlife Biology 2: 65-73. Noer, H., Madsen, J. & Hartmann, P. 2007: Reducing wounding of game by shotgun hunting: effects of a Danish action plan on pink-footed geese. - Journal of Applied Ecology 44: 653-662. Madsen, J. & Riget, F.F. 2007: Do embedded shotgun pellets have a chronic effect on body condition of pink-footed geese? - Journal of Wildlife Management 71(5): 1427–1430. Madsen, J. 2010: Age bias in the bag of pink-footed geese Anser brachyrhynchus: influence of flocking behaviour on vulnerability. European Journal of Wildlife Research 56: 577-582. Holm, T. E., & Madsen, J. 2013: Incidence of embedded shotgun pellets and inferred hunting kill amongst Russian/Baltic Barnacle Geese Branta leucopsis. - European Journal of Wildlife Research 59: 77-80.